From tablet to desktop. Instantly. 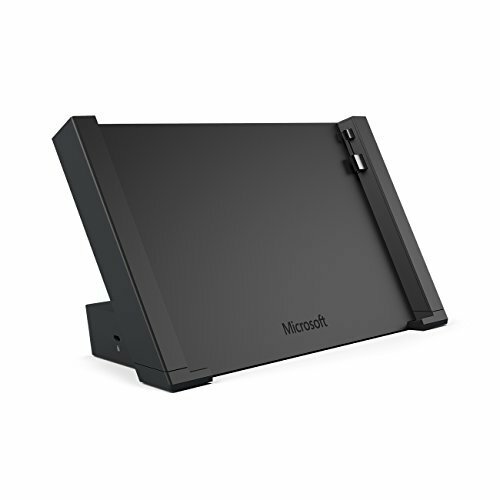 Just click your Surface into the dock to go from tablet to full desktop PC- it's that simple. With an Ethernet port, Mini DisplayPort and four USB ports - two USB 3.0 and two USB 2.0 ports - you have what you need to attach your HD monitor, wired network connection, audio system, full-size keyboard, printer and more. Docking Station delivers plenty of power at 48W. You can work on your device, run or charge your favorite accessories, and still have ample power to charge your Surface battery. Docking Station includes four USB ports - two USB 3.0 and two USB 2.0 ports. Transfer large files to an external drive, plug in a USB printer or headset, charge multiple accessories, and more. The gigabit Ethernet connection is super fast, with data transfer rates up to 1 billion bits per second*. The 48W power supply quickly recharges your Surface battery while you work, so you can hit the road or the halls in no time with a fully-charged device.